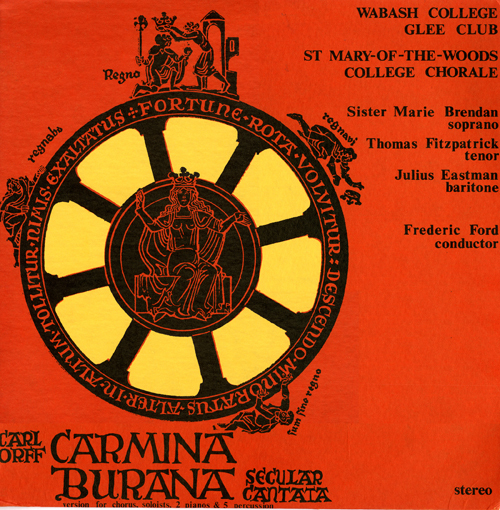 Carmina Burana – Big Bash Bonus! The Big Bash, the annual alumni reunion weekend, is a relatively new idea at Wabash. And from all accounts, it is a big hit! It used to be that our reunions were held during commencement weekend. That was a bit of a crush, so a few years ago Wabash moved the alumni reunion to the first weekend in June when the whole college is totally focused on returning alumni. This year the Bash was as lively as ever. The Lilly Library was hopping with alums and their families. It was wonderful to see so many people laughing, chatting and reminiscing. 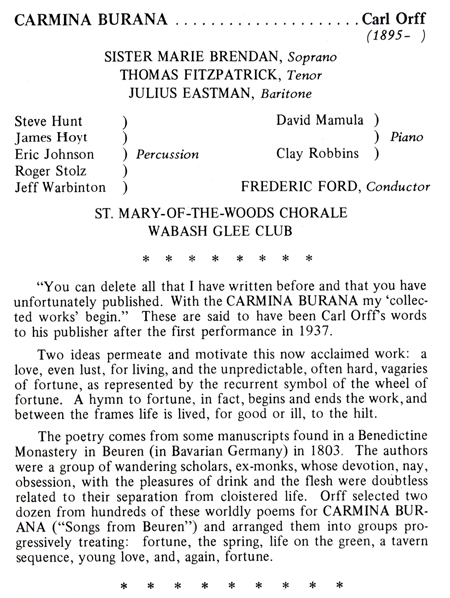 Just this week I received a request for a copy of this performance. Thanks to Adam Bowen and Josh Mitchell [W2013] in the Media Center, now anyone can hear this amazing work! While you are there, be sure to check out the many other items Adam and his good men of the Media Center have added…talk about time travel!!! Last time I posted a bit about the Homecoming festivities this coming fall. There is a Glee Club reunion, the class Agents will all be on campus that day. There is a special Homecoming alumni chapel. There will be a lot going on around campus that weekend. In addition, the Sphinx Club is holding a reunion. As the Sphinx Club has been so closely connected with the Homecoming festivities, this makes perfect sense. In this posting I would like to share the story of the founding of the Sphinx Club on campus. This is from The Bachelor of December 16, 1921. “Packed in a large motor ‘bus and filling a large Buick touring car, twenty men from Wabash traveled down to Bloomington yesterday afternoon, where they were initiated into the Sphinx Club. The party left here about two o’clock and arrived at Indiana at about eight-thirty. The entire Indiana club turned out to initiate the Wabash chapter. It was said by one of the initiates upon returning that the very best treatment was accorded them by the Indiana men. The organization, founded purely for social purposes, will not allow college politics to enter it and the men chosen are supposed to be the best from the fraternity to which they belong. The men who compose the Wabash chapter are: E. K. McComb, R. H. Bostwick, J. K. Ruckelshaus, H. E. Perkins, F. H. Cox, G. W. Stasand, R. P. Cushwa, L. E. Cast, W. H. Acheson, R. A. Porter, P. M. White, J. R. Lauman, E. E. Gullett, J. A. Cragwall, F. M. Taylor, C. N .Smith, J. C. Gauld, M. M. Ellingham, N. S. James, and K. H. Wells. 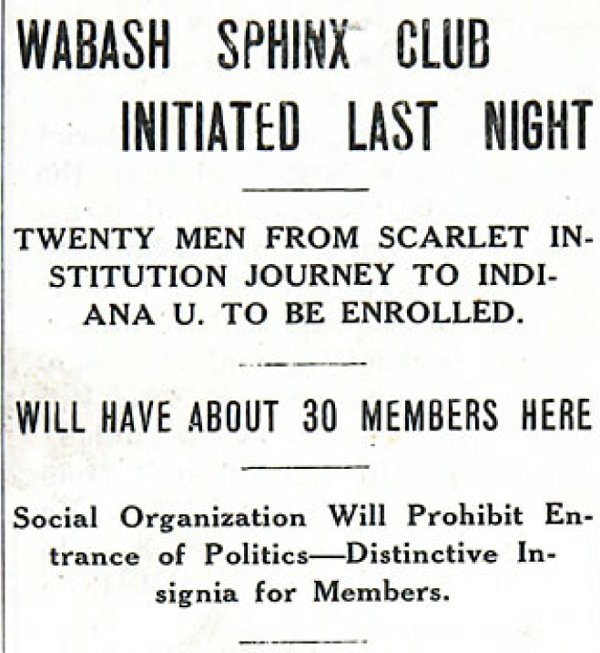 It is the plan of the club to add to its membership until thirty Wabash students are members of the Sphinx Club. The men are pledged and initiated twice each year. 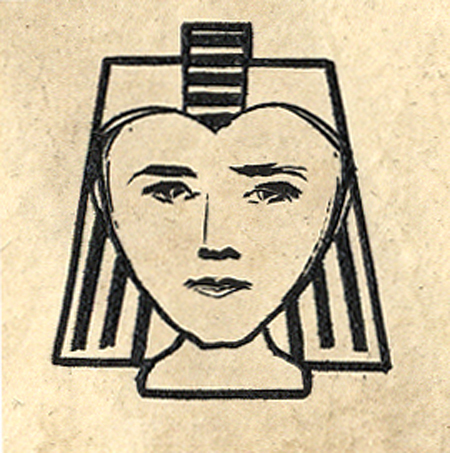 The Sphinx Club insignia consists in the spring and fall, of black and white hats, and in the winter of black and white toques. The insignia of the Wabash chapter has not yet been secured, but it is thought that it will be ready for distribution among the members within. It is probable that three dances will be given by the Sphinx Club each college year, one of which will come immediately after Christmas. As yet, however, there has been no definite action taken by the Club in this regard. Meetings will held each Sunday afternoon and at the next meeting it is understood that definite plans for the Wabash club’s activities during the coming year will be outlined. The following spring, the club held its first, on campus, initiation. From their start on campus the Sphinx Club has been a promoter of campus unity and spirit. Again this year the Sphinx Club will act as a “receiving committee” for the Homecoming festivites. With a long and proud 91 year-old tradition, it is only fitting that the men who wore the “pots” of the Sphinx Club will be right at the center of the celebration.